We welcome pirate metal’s finest, ALESTORM with a big ‘Oh Wow!’ as they join the bill on Saturday’s Ronnie James Dio main stage! Frontman Chris Bowes says, “Oh wow! It’s been 10 years since our debut album, ‘Captain Morgan’s Revenge’ came out and somehow, it’s also been 10 years since we last played Bloodstock Open Air! Let’s have a very silly party time, Englandshire. I promise we won’t be shite.” Grab the 10th Anniversary edition of the debut, released just last month and raise your rum to the lyric video of the title track; https://youtu.be/GTyMhv7MCCs. The much-lauded PALLBEARER join us in a Sunday slot on the Sophie Lancaster stage, bringing their monumental, doom-laden, melodic heaviosity to Catton Park! The Little Rock, Arkansas-based band have been praised by everyone from the New York Times to Loudwire, Decibel and SPIN, and rightly so! The band’s third album, ‘Heartless’ made many journalists’ Top Albums of 2017 list. Check out their video for ‘I Saw The End’, taken from that opus here – https://youtu.be/DNl_18Kr56g. Nottingham hard rockers FAHRAN pick up a Friday slot on the Sophie stage. The band recently released a video for new track, ‘State Of Mind’ taken from their upcoming album, ‘VAPOURS’ – https://youtu.be/KW58TKJGyhw. The opus is set for release this summer. Stay tuned on their latest news at www.facebook.com/Fahranmusic. British rock crew, DOOMSDAY OUTLAW land a spot on Sunday’s Sophie stage bill. The five-piece have just announced new album, ‘Hard Times’, which is set to arrive in May via Frontiers. Check out lead track ‘Spirit That Made Me’ – https://youtu.be/eNMPo5DrsJM and if you like what you hear, you can pre-order the record at radi.al/HardTimes. Final call for the 2018 Deposit Scheme! There are just 6 days left to sign up for BLOODSTOCK’s payment plan, which eases the shock of a ‘lump sum’ payment by breaking your ticket price into five more manageable amounts. Sign up in the ticket store before the cut-off time of 11.59pm on Wednesday 28th Feb for an initial deposit of just £36. Thereafter, four additional instalments of £29 will debit your bank account on 3rd April, 1st May, 1st June and 2nd July respectively and your 2018 ticket is secured! Sign up over at https://bloodstock.seetickets.com. Standard weekend tickets are also available, priced at £145 for four days of metal fun, so grab yours now! If you already know you can only attend for one day, sign up for a day ticket reminder email as day tickets do not go on sale until late June. Register your day ticket interest here – https://www.seetickets.com/register/bloodstock. 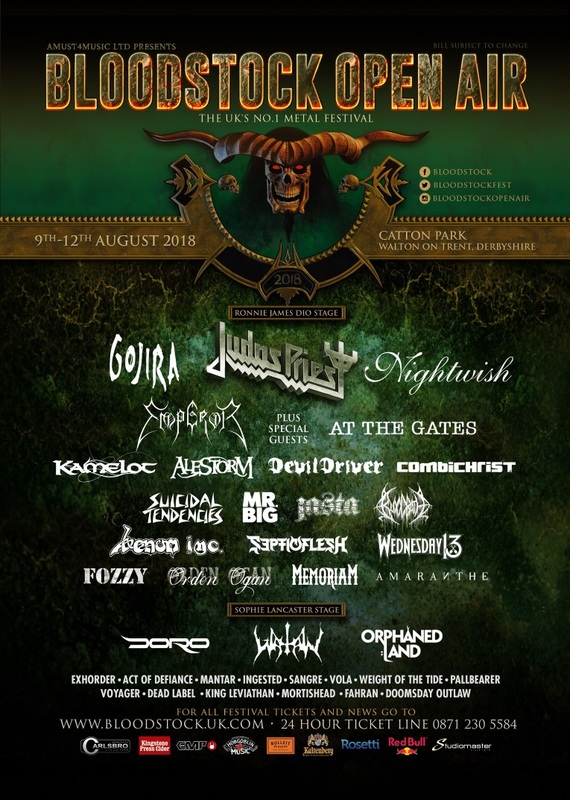 With Friday night headliners, JUDAS PRIEST, Saturday headliners, GOJIRA and Sunday’s bill-toppers, NIGHTWISH already announced, as well as EMPEROR, AT THE GATES, DEVILDRIVER, WATAIN, SUICIDAL TENDENCIES, WEDNESDAY 13, JASTA & FRIENDS, FOZZY, COMBICHRIST, BLOODBATH, VENOM INC., MR BIG, ORPHANED LAND, KAMELOT, DORO, ORDEN OGAN, SEPTICFLESH, AMARANTHE, EXHORDER, VOLA and MEMORIAM so far, 2018 is shaping up to be another stellar year for BLOODSTOCK.